Scratches diminish to a TRUE flawless finish! 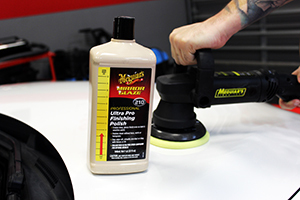 Meguiar’s Ultra Pro Finishing Polish is a professional grade finishing polish that will perfect the look of your vehicle without the use of defect hiding fillers. Meaning the results you get from Meguiar’s Ultra Pro Finishing Polish will last! Meguiar’s Ultra Pro Finishing Polish will expertly buff out any light hazing or other paint defects and polish your paint surface to a perfectly smooth finish! The polishing oils in Meguiar’s Ultra Pro Finishing Polish give it the ability to provide reliable results, even on the most sensitive paint types! 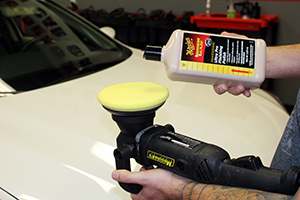 The lack of dusting and slinging combined with the easy wipe-off make Meguiar’s Ultra Pro Finishing Polish an excellent choice for any body shop or professional detailer. If you work in a body shop or as a professional detailer, chances are that you have seen some paint in your time that puts the phrase “rough shape” to shame. When you have a job like that, the most important thing is taking out the severe damage first. This requires you to fight fire with fire, because of this, you often cause quite a bit of damage in the process, albeit less serious damage. This damage manifests in many forms; hazing, holograms, and buffing swirls to name a few. While this damage is much preferred over the intense scratches that were there before, it is still not ideal. This is why to need to follow it up with a high-quality finishing polish like Meguiar’s Ultra Pro Finishing Polish to remove those defects and finish the paint off to a flawless finish! Meguiar’s Ultra Pro Finishing Polish was infused with polishing oils that give it a much gentler touch when you are working on these softer, more sensitive paints. Meguiar’s Ultra Pro Finishing Polish will always provide breath-taking results, regardless of the type of paint on which you’re working! Unlike a compound that you would use to take care of heavy defects, Meguiar’s Ultra Pro Finishing Polish does not leave any damage in its wake. This excellent formula will easily correct the hazing, holograms, and swirling that were caused during your compounding step, gently buffing your paint to a smooth finish! There are many different types of paint out there, some are capable of taking quite a bit of abuse, others with scratch with a stern look. In the latter case, it is crucial that you be extra selective when choosing your polishing products. Meguiar’s Ultra Pro Finishing Polish is a part of Meguiar’s professional line of products, so it was crucial that they took several very important factors into consideration when making it; and they did! Meguiar’s Ultra Pro Finishing Polish was designed to be body-shop safe with no fish-eye causing silicones in its formula. It was also designed to generate little to no slinging or dusting to make prep and clean-up A LOT easier! It will even wipe off clean and easy to make your job much faster!